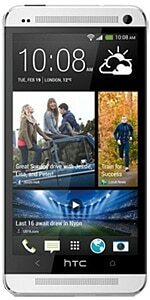 The HTC One M7 is the phone-maker’s flagship device for 2013, boasting a 4.7-inch full HD display, a four core 1.7GHz processor, two front-facing speakers and NFC — all within a sleek aluminium body. The Android 4.1.2 device features an aluminium body along with the latest incarnation of HTC’s user interface, “New Sense”, and initial attention has been focussed on its very capable ‘UltraPixel’ rear camera which promises much improved low light performance. An update to Android 4.2 is promised. The HTC One, previously referred to as HTC M7, was announced on 19 February 2013 and became available in mid-March.